A live “performance/construction site,” called TILT, at New York City‘s Abrons Arts Center’s Experimental Theater combines dance and architecture in the close of a trilogy from Racoco Productions. 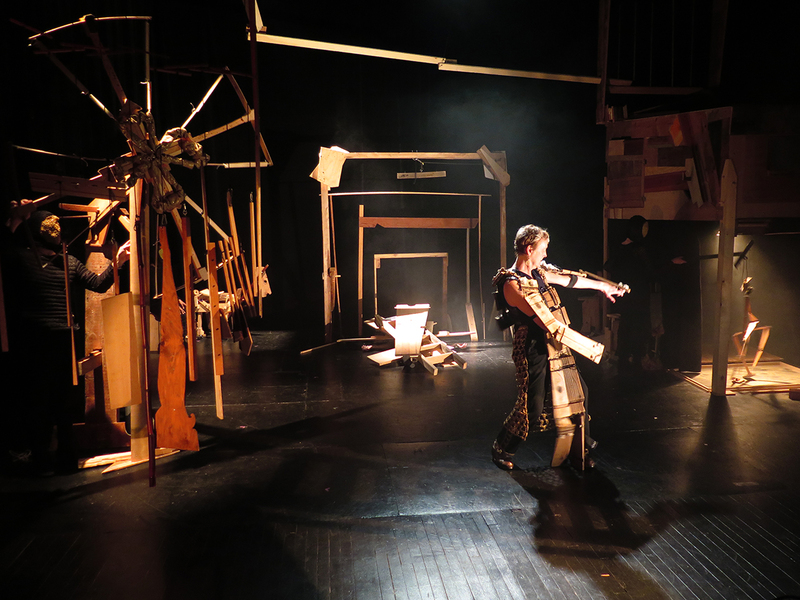 The performance’s action is triggered by the first of three balls rolling down a chute in a primitive Rube Goldberg–like pinball machine, hitting metal chimes then bouncing down a “staircase.” The set is filled with sticks and pieces of wood at first tumbling out of the second-floor door of a shed, which houses a tap dancer in a skirt. The inventive costumes are largely made of wood panel overlays and flexible triangles that are either puppets mimicking the dance or sheaths that articulate movement. Choreography by Rachel Cohen, who stars along with tap dancer Heather Cornell, with live music by Lynn Wright, shows “fantastic excavations of everyday things…quixotic choreography, absurdist visuals, and raw materials”—and even a windmill constructed by four Noh-like dancers in a nod to Don Quixote. 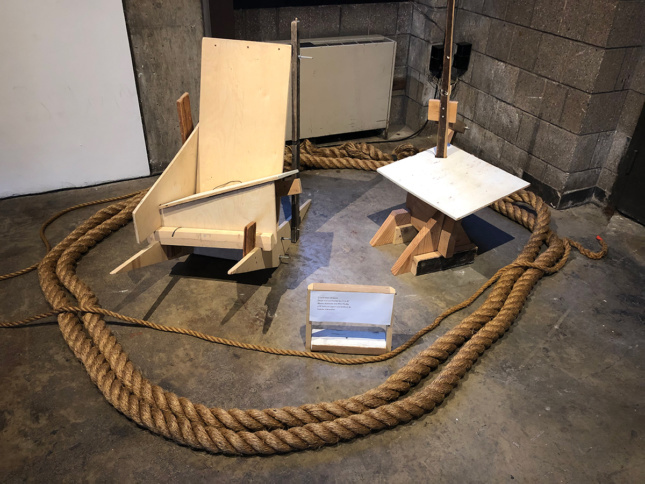 In the lobby are elements from the production—a build your own “throne,” pinball machine, ropes, chairs, costumes, Jacob’s Ladders, building blocks—and from the first two parts of the show’s trilogy, I would and Construct, which used the same raw materials as well as dance movements. For TILT, the final chapter, designer-carpenter Bill Kennedy was brought in to re-envision and expand the set pieces. The staccato and swirling movements perfectly mesh with the construction-site aesthetic of TILT.